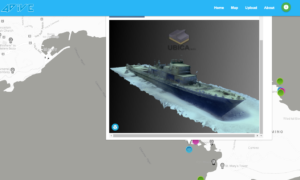 We are happy to present the 4DIVE (4-Dimensional Immersive Visual Experience) web-gis portal that includes five 3D models of Malta shipwrecks. Thanks to the enthusiastic scuba diver volunteers that made this possible by collecting thousands of images! Thanks to the local diving centers, the GreenBubbles consortium, and ISTI-CNR for supporting us. Tagged 3D, citizen science, conservation, diving, structure from motion. Bookmark the permalink.